My one year "X-iversary"! Hard to believe that one year (+1 day*) ago, I was a total X PRIZE n00b. Facing off with Will in a Moonpie eating contest. Although "contest" might be a strong word for it, as Will basically inhaled two strawberry moonpie minis. 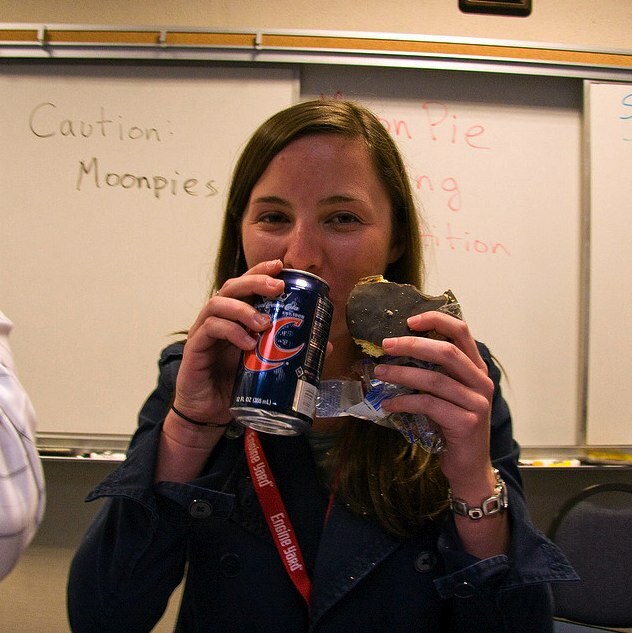 Additional lesson learned: in a competition involving rapid consumption of moonpies and chugging of cola, there really are no winners. 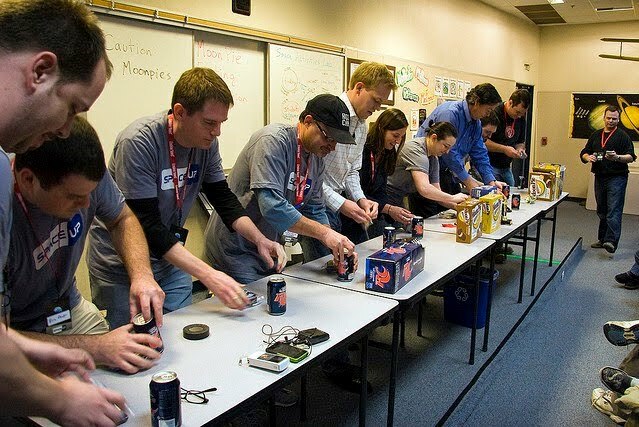 The Northrop Grumman Lunar Lander X Challenge competition. My first two months were largely spent out in the Mojave desert, where I learned at light speed the ins-and-outs of webcasting and covering live events online. I distinctly remember hanging out on the roof of a car at non-negligible distances from hovering rockets and thinking, "Best. job. ever." My first Team Summit at NASA JPL. This was the first time that I got to meet members of most Google Lunar X PRIZE teams in person, our brand new education manager, Chanda, and tour JPL. Riding conference bikes at Google. There was a lot more gleeful giggling than conferencing going on when we took one of these crazy contraptions for a spin, but that's ok.
Getting accepted, organizing a panel, and attending SXSW. Meeting the internet in person and talking to it directly about space was awesome. 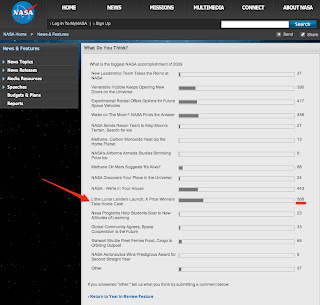 Crossing our fingers for a follow-on "Moon 2.0" panel in 2011. First ever X PRIZE Tweetup with Anousheh Ansari. In the spring, we gathered up 100 of our local Twitter friends to hang out at X PRIZE and meet one of our very inspiring, space fanatical board members. Fun was had -- expect more of these in the future. Spending the summer at the Speedway. Watched (and covered online) the drama of the Progressive Automotive X PRIZE finals as it unfolded from a suite on the side of the Michigan International Speedway. LOLing at my desk on a near-daily basis at updates/links from the GLXP online community. Pretty sure that my co-workers think I'm nuts. Thanks, guys. Hanging out with Scouts at the Jamboree. Hanging out with thousands of kids that were excited about technology and space, despite the oppressive Virginia heat, was awesome. Being on the brink of heat stroke just added to the memories. It has been a fun year, and there are many more things that I'd love to add to this list (but won't, for the reader's sake). The amazing online community has continued to build, with 2400 new friends on Twitter and almost 3000 new fans on Facebook, plus a slew of followers on a new platform: Google Buzz. I've also seen three new teams officially join the competition in my time here, bringing the total number to 21. Here are a few photos from the past year. Thanks to you all for helping to make it such a great one, and here's to many more! 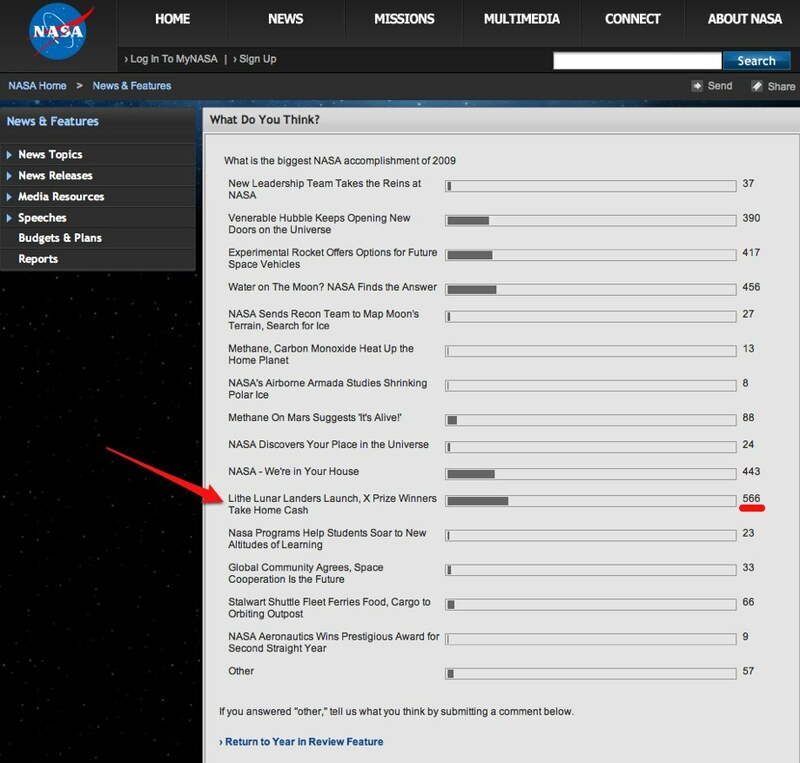 "Lithe Lunar Landers Launch" wins the NASA 2009 "Year in Review" poll, beating out discovery of water on the Moon. Boo yah, GLXP community. Xombie Launch! Tweeting/photographing as NGLLC unfolded. 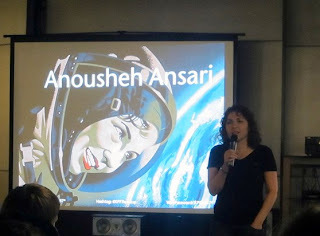 Anousheh speaking at the XPF Tweetup.